Arturo Giovannitti, the son of a pharmacist, was born in Ripabottoni, Italy, on 7th January, 1884. After finishing his education he emigrated to Canada. At the time he was deeply religious and he studied in several theological seminaries near Montreal. In 1904 he moved to New York City. Giovannitti did a variety of different jobs after arriving in America. He was also an active trade unionist and became the leader of the Italian Socialist Federation of North America. He joined the Industrial Workers of the World (IWW), and in 1911 he became the editor of Il Proletario, a radical Italian-language weekly. In January 1912 the American Woolen Company in Lawrence, Massachusetts, reduced the wages of its workers. This caused a walk-out and the IW), who had been busy recruiting workers into the union, took control of the dispute that became known as the Lawrence Textile Strike. The IWW formed a strike committee with two representatives from each of the nationalities in the industry. It was decided to demand a 15 per cent increase in wages, double-time for overtime work and a 55 hour week. The mayor of Lawrence called in the local militia and attempts were made to stop the workers from picketing. Thirty-six of the workers were arrested and most of them sentenced to a year in prison. Money was collected throughout America to help the strikers. The IWW sent Giovannitti to Lawrence to help organize relief. A network of soup kitchens and food distribution stations were set up and striking families received from $2 to $5 cash a week. Soon afterwards Elizabeth Gurley Flynn, Bill Haywood, and Carlo Tresca of the IWW arrived in Lawrence and took over the running of the strike. The governor of Massachusetts ordered out the state militia and during one demonstration, a fifteen-year old boy was killed by a militiaman's bayonet. Soon afterwards a woman striker, Anna LoPizzo was shot dead. The union claimed that she had been killed by a police officer, but Joseph Caruso, a striker, was charged with her murder. Arturo Giovannitti and Joseph Ettor, who were three miles away speaking at a strike meeting, were arrested and charged as "accessories to the murder". The socialist lawyer, Fred H. Moore, was sent to Lawrence to defend them. Faced with growing bad publicity, on 12th March, 1912, the American Woolen Company acceded to all the strikers' demands. By the end of the month, the rest of the other textile companies in Lawrence also agreed to pay the higher wages. However, Giovannitti and Ettor remained in prison without trial. Protest meetings took place in cities throughout America and the case eventually took place in Salem. On 26th November, 1912, both men were acquitted. 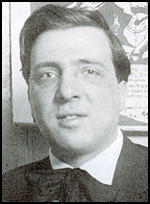 Giovannitti returned to New York City and began to associate with a group of socialists that lived in Greenwich Village. This included Max Eastman, John Reed, Floyd Dell, Robert Minor, Art Young, Michael Gold and Boardman Robinson. He also became a regular contributor to the socialist journal, The Masses. In 1914 Giovannitti published a book of poems, Arrows in the Gate, which had an introduction by Helen Keller. Giovannitti believed that the First World War had been caused by the imperialist competitive system and that the USA should remain neutral. Over the next three years he was busy with anti-war agitation. He also founded two short-lived Italian-language political journals, Il Fuoco (1915) and Vita (1916). He also staged the first of his Italian-language dramas, Tenebre Rose. The Industrial Workers of the World was virtually destroyed by its attempts to prevent American entry into the First World War and the Red Scare that followed. Giovannitti decided to abandon his involvement with revolutionary syndicalism and instead concentrated on traditional trade unionism. Over the next few years he played an important role in establishing the Italian Dress Makers Union and the International Ladies Garment Workers Union. He also contributed to the New Masses journal. In the 1920s and 1930s Giovannitti was considered to be one of the greatest orators in the labour movement. Max Eastman commented that Giovannitti and Joseph Ettor were as well known to American radicals as Lenin and Leon Trotsky. As Robert D'Attilio has pointed out: "Their voices, which had been among the most intelligent and the most energetic in the fight for freedom and social justice in the beginning of this century, faded, however, into obscurity, melancholy examples of how difficult it is to sustain a lifelong radical posture in America." Arturo Giovannitti worked as a farmer and wine maker in California before he died on 31st October, 1959. (2) Helen Keller, introduction to a book of poems by Arturo Giovannitti. No one has ever given me a good reason why we should obey unjust laws. When a government depends for "law and order" upon the militia and the police, its mission in the world is nearly finished. We believe, at least we hope, that our capitalist government is near its end. We wish to hasten its end. I am sure this book will go on its way thrilling to new courage those who fight for freedom. It will move some to think and keep them glad that they have thought. Until the end of World War II when his health failed, he wrote and spoke extensively in the struggle to establish organized labour. At various times he was a close associate of Max Eastman, Norman Thomas, David Dubinsky, and many others. At the fiery labor rallies in the Nineteen Twenties and Thirties, Mr. Giovannitti was in great demand as a speaker. A colorful figure, with a Van Dyke beard, a Lord Byron collar and flowing tie, he addressed Italian and English-speaking audiences with an equally flowery fluency.